The soprano, Svetelina Vassileva, was born 20 November 1966 in Etropole. While studying voice with Konstanza Vachkova at the State Academy of Music she received training at the School of Education. 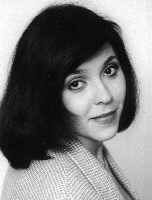 After beginning her singing career at the Musical Theater (1991-93), she joined the Sofia National Opera in 1993 with here debut there as Amelia in the Masked Ball in the summer of 1994. In 1992 she was a winner in the Tito Schipa competition and in 1993 in the Amichi del Lodjone at La Scala. An international career developed quickly with engagements in San Francisco in 1994-95 and 1998, Ireland in 1996, Brussels in 1997, Covent Garden in 1997-98, Edinburg Festival 1997, Toronto 1997, 1999 & 2000, Palm Beach 1997 and in Baltimore, Cincinnati and Detroit. Svetelina is in much demand with contracts to sing at the Metropolitan Opera and Houston in 2001-2002, Scottish Opera 2001 and in Berlin 2002-2003. Major roles in her career include Amelia, Leonora in Trovatore, Violetta, Desdemona, Tatyana, Liu, Mimi, Elizabeth in Don Carlo, and Druzila in L'Incoronazione di Poppea.